The show is scheduled for 9-10 p.m. EST on ABC and will also feature “Footloose” by Kenny Loggins, “Bette Davis Eyes” by Kim Carnes, “Ghostbusters” by Ray Parker Jr. and “Celebration” by Kool & The Gang” – all part of my 1980s soundtrack (which I’m sure is true for many people). Those who were a big fan of 1980s RS and are going to one of his concerts this year after a decades-long hiatus will likely recognize most of the songs because there are so many hits from those days. But he’s also been including some of the songs from “Rocket Science” at his live shows. So far “Light This Party Up,” “Down,” “That One” and “Miss Mayhem” have been part of current set lists. So now that “Rocket Science” has been out a few months – it came out Feb. 19 – let’s see where the songs are today. “Light This Party Up”: Fans first heard this song at the RS fan event at the Club Med event in April 2015. I unfortunately was not one of the fortunate ones to be there, but someone posted videos to share the experience. I first heard it live in October 2015. In December 2015, USA Today presented the official world premiere. About a month after “Rocket Science” was released, a snippet of the song was played in an ABC Wednesday night promo for “The Middle.” Then there’s this video, which is part animation, part concert footage. “Down”: I first heard this song live in October 2015, at the same show as “Light This Party Up.” But by then, I had heard it countless times on videos other people posted from past shows. 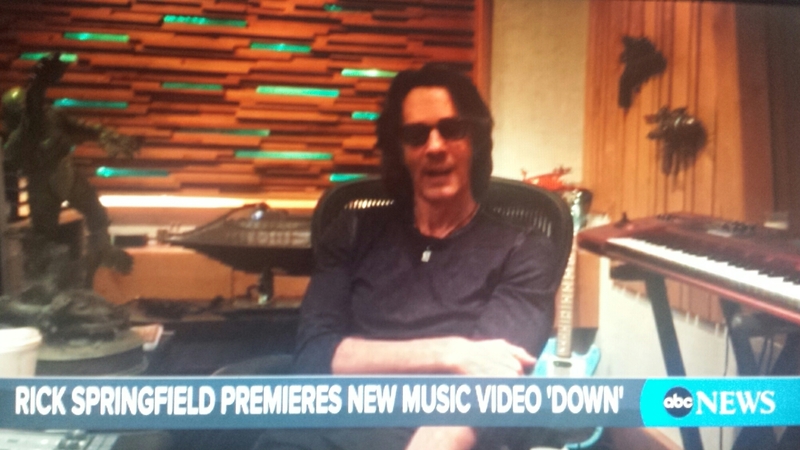 An official audio video was released in December 2015 and the official video – shot at Sunset Cliffs in San Diego – was released this week after an ABC interview in his home studio. The song also is currently the theme song for the “Sundays with Carolyn & Dan” show on QVC. “That One”: The debut for this song was on the Yahoo Live Stream of a concert in Nashville, about a week before the CD’s release. “Miss Mayhem”: Another one that was released in early February – before the CD. (B.C.D.?) This sneak peek debuted on guitarplayer.com. “Pay It Forward”: The concept of this song was used for a benefit concert for the American Cancer Society in Palm Springs, California. If people weren’t able to attend the concert, but still wanted to contribute, they could purchase tickets for cancer survivors. Such a cool idea. Let Me In: This song was originally released as a bonus song on “Songs for the End of the World,” but the “Rocket Science” version has more of a country sound. It also has a more upbeat vibe to it, which fits with the idea that the new album has a more positive message than its predecessor. This new version’s premiere was released in January 2016 on billboard.com, along with an acoustic version. Time will tell what the destiny of these songs will be, but for now they are considered his new songs – although for many of his fans, they are already as familiar as ones on past albums. This past week’s news feels much more like “Songs for the End of the World” than “Rocket Science.” It may even be closer to a “Shock/Denial/Anger/Acceptance” feeling. It makes me nostalgic for the “Working Class Dog” and “Success Hasn’t Spoiled Me Yet” days. If more people in this world were “Karma”-oriented and more “Tao”-conscious, there would be more harmony in the world. But seriously, what’s up with the world these days? I know, most people don’t pay that close attention to our favorite rock star as much as his fans do, but is it really that confusing? Is it only because they are both rock musicians who both have last names that start with “Spring” that people mix them up so much? It’s usually harmless, albeit annoying, but there was a case earlier this year when an article posted about Bruce Springsteen cancelling a North Carolina concert was posted with a photo of RS. Whoops. But then there was some hateful posts against RS because of Bruce’s decision. They also entered the world the same year, a month apart: RS was born – as Richard Springthorpe – on Aug. 23, 1949 and Bruce was born that year on Sept. 23. But I still don’t get all the confusion. Good thing RS seems to have a sense of humor about it (as his song “Bruce” seems to convey). So here’s a tip for those who confuse the two: The title of Bruce Springsteen’s most well-known album and single is “Born in the U.S.A.” Rick Springfield was born in Australia. Maybe RS should go back to using his Australian accent when doing interviews? Sadness permeates the RS community this week with the loss of guitar tech Ruben Velasco, who lost his battle with lung cancer at age 41 on May 31. Even though it was known he was sick – he was first diagnosed in 2014 – it still comes as a shock because it always is when somebody that young dies. What started as a fan effort to raise funds to help pay for medical expenses has now become a memorial fund to help his family pay for the medical bills and for his funeral. Learn more about the Still Rockin’ for Ruben Memorial Fund on at weloverickspringfield.com. Donations can be made on the YouCaring page. And tonight, Rowdy Ron – who is wrapping up his online radio show this weekend – is dedicating tonight’s show to Ruben by playing the hard rock music he loved. Tune in to “Remembering Ruben” at 9 p.m. EST here. My condolences to Ruben’s family and friends.